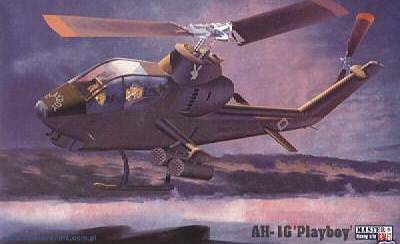 While we currently know nothing about the origins or accuracy of these kits, there has to be a suspicion that they are related to the AH-1G released by ZTS Plastyk in 1997. More on this next time, by which time we hope to have seen one in the flesh. 2. 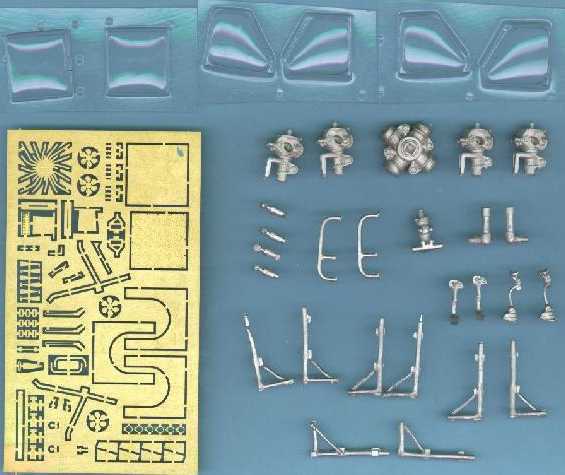 Coming soon from Amodel will be #72113, the Swidnik SM-1/300 SP-SAD which was flown by the Institute of Aviation (Instytucie Lotnictwa) in Warsaw with additional wings. These were considered both for their lifting properties and as attachments for weapons and fuel tanks. The first flight of the was made on 23 March 1956. The standard SM-1/300 was equivalent to the Soviet Mi-1T. 3. 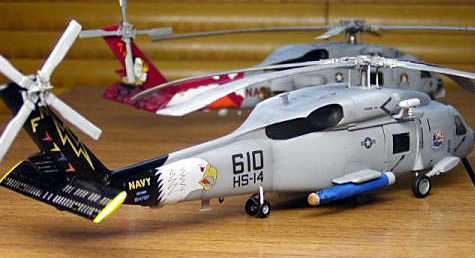 MRC/Academy announced the forthcoming release of a 1:48 CH-46 Sea Knight at the recent Las Vegas Hobby Show. A report by Michael Benolkin, including this picture, can be found in the October 2003 edition of Internet Modeler. The test tree that was on display carries the fuselage halves, doors, cockpit details, and separate cargo bay interior walls. They've designed the kit with several different sets of rotor blades and other relevant details to produce both early and late versions of the aircraft. Release dates are not yet available, but it is believed the first will be a CH-46E/F (latest Iraq boxart), with others to follow including KV-107, CH-113 Labrador/Voyageur, and US Presidential fleet aircraft. 4. NightFlight Models have decided that the first release in their eagerly anticipated 1:35 H-53 series will be the Sea Dragon, mainly because of the excellent support they have received from one of the USN units operating this variant. We expect to be able to announce further very exciting news from Nightflight here soon. 4408 1:72 BK-117 "Space Ship"
7. 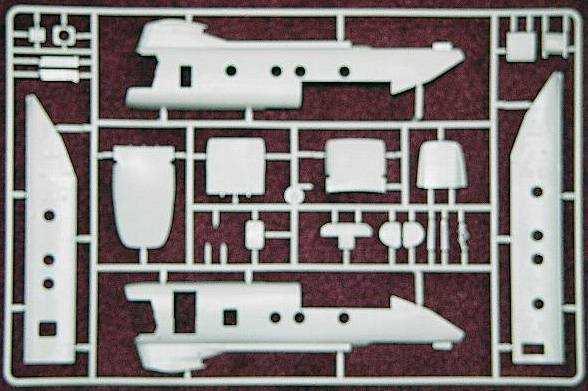 Flying Papa's have released a new set of decals (48M-066) to go with the 1:48 Italeri Seahawk kit. 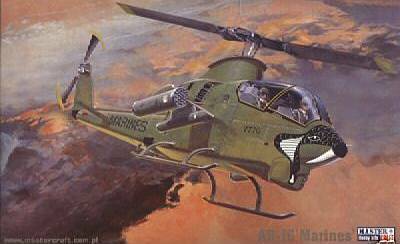 This gives you markings for the HS-14 'Chargers' SH-60F BuNo. 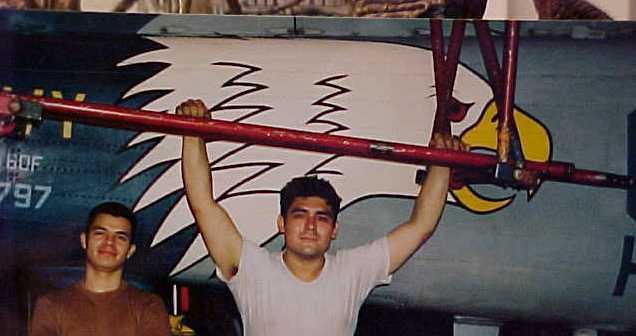 164797 '610'/NF from CVW-5 on the USS Independence at NAF Atsugi, Japan, with the Eagle artwork on the tail. 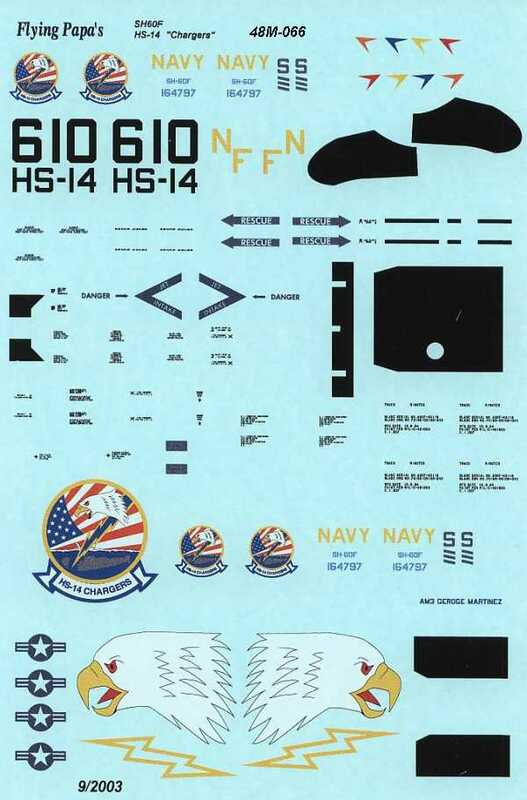 This sheet is also available in 1:72 scale (72M-016), see HKN #168. 8. 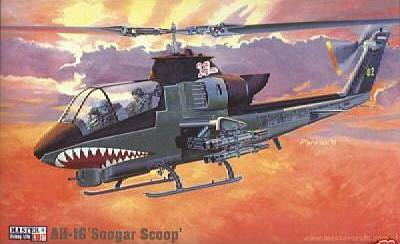 TwoBobs Aviation Graphics have confirmed their intention to re-print sheet 35-001 AH-1W 'Whiskey's in the Mix', probably before the end of November. 9. Landing Zone Publications Close Up No.2 by Philippe Dognon & Christian Bouschon will feature the CH-53E Super Stallion and the MH-53 Sea Dragon. As with No.1 (HKN #160) it has 40 colour pages with approximately 200 original photographs, 99% of which have not been published before. The text is in English and French, and the publication date is 15th November. 10. 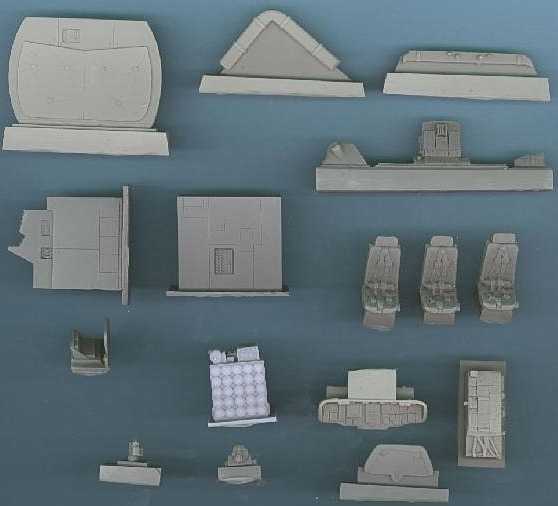 And finally, note that the HKN Gallery has been extended to include the 'Sprue Zone', a database of images of unbuilt kits. This includes a very handy little feature that lets you compare any two kits side by side. 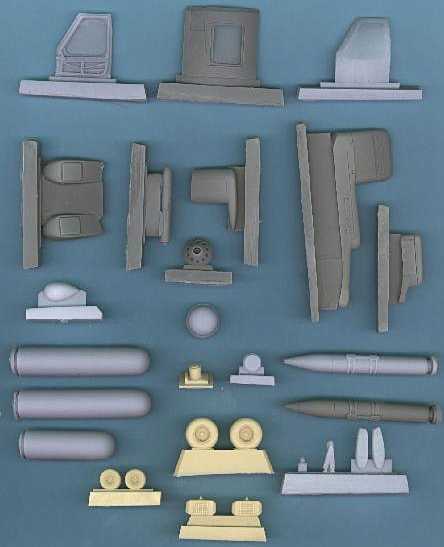 The number of entries is increasing daily, and anyone can post images of their own kits here (preferably following the general format of the ones that have already been added by HKN). Thanks to Shuichi Manei (Flying Papa's), Tony Morgan, Michael Benolkin (Internet Modeler), Martin Elcox (Pointer Systems / HKN Gallery), Philippe Dognon (Landing Zone), Lindsay Perry and William F. Beasley (Nightflight).